The Bache Group has been involved in the design, manufacture and repair of stillages, primarily for the automotive sector, for over fifty years. With a highly skilled work force with decades of welding and fitting experience, we have the ability to manufacture from our standard range or a bespoke product to match your requirements, no matter the project size or complexity. Investing heavily in research and development and the latest machinery, we work with a range of materials including Steel, Plastics, Textiles and Hydraulics. We have the flexibility to manufacture in-house at our central production facility in the West Midlands, or overseas in both Europe and Asia, with our wholly owned UK factory premises allowing us to work to shorter project time frames, permitting quick turnarounds. Blending traditional skills with the latest CNC machinery, including robotic welders, metal punching, cropping equipment and press brakes, our processes ensure maximum efficiency across all projects, whether our output is small batch or high volume. We supply to the Automotive industry, both UK and overseas, the MoD and Materials Handling Industries, alongside a range of other specialisms and our innovative processes allow us the ability to continuously work with new industrial sectors. With recent investment in additional production space we have increased our footprint by nearly 30,000 sq ft. This along with continued investment in our production facilities and machinery has allowed us to increase productivity and efficiency, ensuring that we are on the pulse of new technological developments in our industry. The most recent acquisition is the Amada Quattro CNC laser cutter. The Quattro provides laser versatility from a very small footprint. 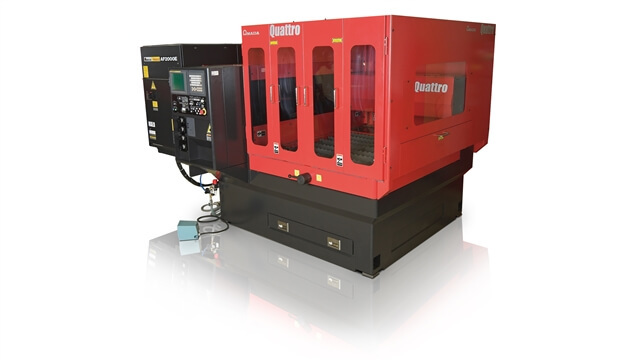 It combines the latest design and development in machine, CNC and laser oscillator technologies whilst also offering low operational and maintenance costs, impressive ease of use and low cost per part.